iWindsurf Community :: View topic - Foil God at the Hatch Wed. morning !! ?? Posted: Thu Aug 02, 2018 11:21 am Post subject: Foil God at the Hatch Wed. morning !! ?? Looked like he had an extra long mast. Never dropped below 3' above the water crazy speed and wind angles. Sailworks sail. Mind blowing. Spending MORE time on swell sounds more fun to me. It's a waste of good swell to go faster. So...<yawn>. The crazy speed was when he went back to give them another go. With the foil "in" the swell it's supposed to be a better connection and feel. Seemed to be impervious to the gusts and holes? Was wondering who that Superman was? Was also a paddle foil surfer saying several sailors almost crashed into him? Half the time those guys are on their belly paddling up wind through the biggest swell zone at the Hatch. Everybody I've seen gives them space, but being down in the swell is always a dangerous place to be, whether your a foil surfer, windsurfer, or kitboarder--difficult to see you. And what is up with the jet ski's trying to tow in these pussies on the foil surfboards! Why not just learn a true windsport? When they do get hit, it will be their own fault. It's public access to a public right of way. I don't like jet skis - but they have as much right to be there as anyone else. 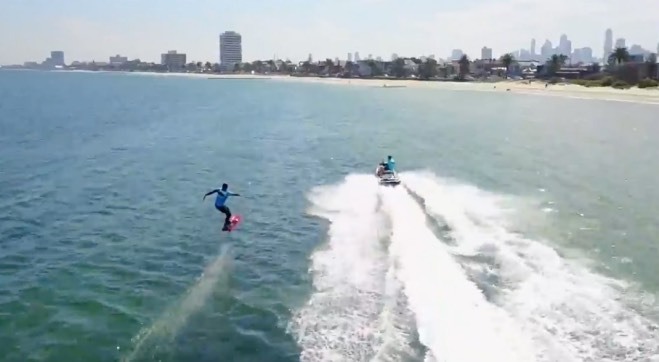 Using boats or jet skis to tow people on foils is a teaching technique Wyatt and Tyson first used in La Ventana. Their idea was that towing a student on a foil board allows them to learn basic balance and turning skills on a foil without having to learn the very different sail skills at the same time. Sort of how you learn the basics of regular windsurfing using a tiny sail and a huge board so you don't have to deal with balance and speed while learning about winds and sail mechanics. Sounds like a good learning tool to me! "1. How hard is windsurf foiling to learn? While foiling certainly adds a whole new layer of complexity to windsurfing, learning, when done right, isn’t all that difficult if you’re a decent windsurfer. If you can try to foil behind a jetski or boat first, you’ll have a head start, and if you go through Foil Academy (www.foil-academy.com) and start with a shorter mast, you’ll be feeling the freedom of flight in no time." But I am sure that some people might just like being towed around in circles by a jet ski on a foil never progress to the sail part. Legally that may currently be true but certainly not etiquette wise. It is extremely bad form for any human powered craft (SUP, kayak, etc) to traverse through a crowded swell zone perpendicular to the direction of the main user groups (windsurf/kite) and it should be illegal for any engine powered craft (boat, jet ski, etc) to do so. I believe CGWA is working on some legislation in this regard. Craft under oar/paddle power give way to craft under sail. Westender, do you have any more info on what sort of foil gear this guy was on? LP, Slingshot, etc. Interested in what the foil gods are riding these days.